No, those beauties don't belong to me. They're just finished copies at the publisher. 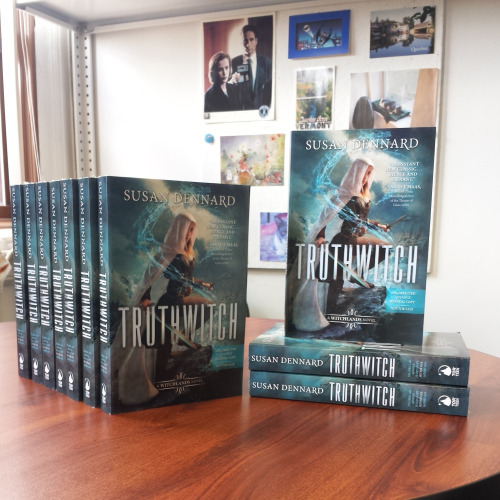 Truthwitch by Susan Dennard is a magical epic that does the great history of high fantasy proud. If you need to know why you should read it, check out my review. If you're already psyched to read it or you already have, come with me on a musical journey through the novel. While I'm sure a Lord of the Rings style orchestral soundtrack would be lovely, I decided to go with an indie/alternative mix. Here are the songs that give me the Truthwitch feels, matched up with the scenes and people I attach them to. In as spoiler-free a manner as I could make it, so the descriptions get quite vague towards the end. Want to listen? Check it out on Spotify or Youtube. Or scroll to the bottom for the embedded Spotify playlist. This song is what I imagine might be playing during the credits. Its sort of magical and dark, and has the feeling of something vast just beginning. Then the credits end, the story begins, and the tone changes dramatically. I just couldn't help but imagine this sort of raucous, Irishy song playing during Safi and Iseult's disastrous heist and daring escape. Plus, it has that jaunty piratey feel that you get from the first bit of the book. Now because I'm an alt freak, we switch gears into something a little more emotional. I imagine this being sort of Safi and Iseult's friendship song. "We're a mess but we try." "Til death do us part." "I just want to be a criminal with you." I figure this one starts after the heist, when things are cooling down and Safi and Iseult are returning to their city, planning the rest of their lives. Enter Merik, meeting with the leaders of the empires who keep his people poor and subjugated. I think this song's anti-authority, angry tone fits what I imagine is going on in Merik's head as he's having this meeting--and his personality in general. "We'll never drink your medicine and we'll never think your way. Masters of broken promises are born to manipulate." It's the perfect intro for a pissed-off Windwitch. I wanted something a bit more violent for the sort of brawl that goes on during the next big plot point, but I couldn't resist this song. The idea of "bad blood" works on so many levels with the kind of enemy here--a literal sense, a foreshadowing. Plus if the battle scene is in a sort of cool comic-booky slow motion, then the rhythm works fine. This song is Iseult. Soft, a little melancholy, but intense. The tone of it, the quietness that erupts in a kind of plaintive cry, really evokes for me the scene where Iseult is visiting a place she used to know, a place that makes her feel like a child again, a place that also makes her feel alien. The ambivalence. "I want to be a kid again. Don't tell me this is home." The idea of making a shadow also makes me think of Iseult's ethereal Threadwitchery. I wanted something a little more Eastern European for the dance scene, but this four-beat song does well enough for a four step. While it doesn't have the speed I'd imagine for a Nubrevnan four-step, it has that intensity and confrontation I felt from that scene. Okay, I got a little literal here. But for this scene, when Safi's life is changing so dramatically and violently, I thought this song had a nice mix of gritty intensity, hurt, and lostness. What better song to backdrop Iseult and Safi making their own way? The bittersweetness of the tone is perfect, too. There is so much to be gained, yet so much lost. Things begin to come to a head, Bloodwitches battling runaways, people abandoned and torn apart. This song is Aeduan to me--his ferocity, his hollowness, his turmoil. "No light, no light, in your bright blue eyes." Okay, partly this is a joke about a certain battle that occurs around a lighthouse. But I also think it's a nice transition from the intense battle and escape to a sea journey. There are hints of hope in the tone, but also wistfulness, confusion, feelings of betrayal and worry and being unmoored. "Is this my life? Am I breathing underwater?" Besides the "We walk the plank with our eyes wide open" which I just had to get in for pirate punniness, this song is similar to Metric's in its wistfulness, its description of a willingness to journey into the unknown. To embrace a new adventure. This is another softer, emotional song. This stretch of three or four songs really matches the part of the novel where things are changing, tenuous friendships are forming, and understanding is beginning to form between strangers. "Welcome to the inner workings of my mind." You can't have a sea fight without something raucous and gritty and fast. Unless you're imagining a slow-motion Underworld sort of fight, in which case you need this raw industrial backdrop. It also works nicely as a transition from the violence to the aftermath. This song is all about desire, a carnal need, but a dark one. "I want to bring you to my hell." An uncertain one. A passion that's sudden and consuming and fearful. I think this works on two levels: for an actual romance, and for a meeting between two people with similar souls and twisted motives. This song has a sort of sea-like, Eastern feel to it. It's a bit happy, a bit sad, a bit reminiscent of ancient echoes and choruses. A perfect song of discovery for people searching for something. Just as it says, this is a welcome for someone, someone who's finally reached something important. A Gift they didn't know was coming. There's a quiet hopefulness in this that really captures this scene. A renewal. "Heal the scars from off my back. I don't need them anymore." This is a bittersweet love song for people coming together--tentative, hungry but knowing they're doomed, knowing they're being pulled into something. A sweet and longing song. Of wanting to give in. This is a raw, clawing song for a battle and a storm. I also can't believe how many water references I worked in without realizing: "Mayday, mayday, this ship is sinking." This song is a war cry, and it's also a song of terror, of self-doubt, and of mourning. This is a song of love, deep love between people both romantic and platonic, and it's a song of that love and that world shattering. It's a song of desperate grief as vast as the explosion of the moon. "The stars, the moon, they have all been blown up." This is the downslide. The beginning of the fall. The final chase. Things have been lost but there are still others that can be salvaged. It's a song for a time of desperation and narrow escape. A song for the dreamlike chaos when everything begins to fall apart. This is a bittersweet song for the end. Things have changed. People have been flung apart. Others have been lost. It's a plaintive song of ending but also of hope held fiercely despite the darkness around it. "I hope for a new breath, a new life to take me away." A song to close one book and presage another. Imagine the end credits playing. The last page is turned. This soft, melancholy, but vibrant instrumental sitting with you as the pieces all fall together. A beautiful ending for a beautiful novel. What songs would you pick for Truthwitch? Have you made a playlist for a novel before?